For July's Monochrome challenge, I made a late 18th century black silk ruffled petticoat, the first piece of a black and white ensemble I'm making for an event in October. Here is the finished petticoat! This is a late finish challenge, started and finished in August, as I'm behind in HSM challenges and now trying to catch up! The Challenge: Monochrome - make a garment in black, white, or any shade of grey in between. Pattern: I've made these so many times, I don't follow a pattern anymore: I measure how long I want the petticoat (how many inches) double it, cut in half, put selvedge to selvedge, and then sew together the sides starting 11" down (for pocket slits). Then pleat to a waistband, the add ties, then hem or add a ruffle or bias ruffle gathered at the bottom via gathers or pleats. Voila! The original basic directions of how to do a basic (unruffled) petticoat was from J.P. Ryan pattern I used years ago. Notions: None, the ties are self fabric. Hours to complete: An hour to cut out, pin and sew the side seams, another two hours to pleat then re-pleat and sew together, another hour to cut out ruffle, sew gathering stitch, then gathering threads broke, so then I pleated the ruffle by hand. Probably 6 all together. First worn: Not yet worn: part of a black and white ensemble for an event in October. Total cost: Black silk taffeta was from the stash, so yay. Paid $18/yard I think. Recently I did a big de-stash of fabric and antique/vintage things, and thus have been adding lots of listings to my Etsy store, TheLadyDetalle! I have way, way too much fabric in my stash (and opps! I continue to buy more when I find gorgeous fabric at great prices, thus you all can benefit from this too! ), so it's time for me to share all the things, so I recently posted: silk fabric, my new hooded cape pattern, a few sari's/saree's, silk cotton blend fabric, crystal candlesticks, a Marie Antoinette embroidered silk muff, embroidered purple muff, and other fun things! I'm really enjoying the Etsy shop, and being able to share things through the store with others. It's exciting when people purchase supplies in my shop like fabric and then share what they made with it: it's very inspiring! Please use this coupon: "COCO16PEB" for 20% off your next purchase through 9/30. Enjoy! Also please visit my other Etsy shop, Regency Tea, for customer favorites: Sticky Toffee Pudding, Cream Earl Grey & Chocolate Vanilla Mint! 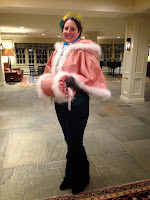 For June's HSM challenge of TRAVEL, I made a late 18th century seafoam blue wool hooded cape! I was on a mission to get a wool cape done for another example for my Costume College class, so I made this hooded cape in June! (Posted late). The Challenge: Travel - make a garment for travelling, or inspired by travel. Pattern: My new TheLadyDetalle Hooded Cape Pattern now available on Etsy! How historically accurate is it? Very! All hand sewn except the staystitch I did inside to hold the fashion and lining together until I hand sewed it together using the bias binding. The material is what they would have had at the time, wool and linen. The colors are period appropriate, and the shape is period appropriate, based on garments like these. Hours to complete: An hour to cut out and staystitch, an hour to make bias binding and pin on. A few hours to sew binding on, pleat to fit neckline and hood, and finishing work. Probably 5-6 total. I have made a few of these now, so I'm getting a little faster. First worn: Not yet worn: made as an example for my Costume College limited class, "Winter Wear - Hooded Cape Workshop" taught a few weeks ago! Total cost: The fine seafoam blue wool was bought at Fort Fred Market Fair earlier this year: $9 a yard. (Used about 3+ yards). Linen lining was about $8-9 a yard, and used about 3 yards). So roughly $50. And I have some big leftover fabric pieces to use to make accessories and other things! For April's 'Gender-Bender' challenge, I made a Napoleonic bee open court robe, which reflects the heavy influence of men and the politics of the day on women's dress. During this part of the Regency era, Napoleon used the bee as a symbol of his strength, reign and power. Thus 'Napoleonic' bees became a part of ladies court wear: it was worn by Empress Josephine, a fashion leader of the day, the Emperor Napoleon himself, the royal family and a few favored members of his court. 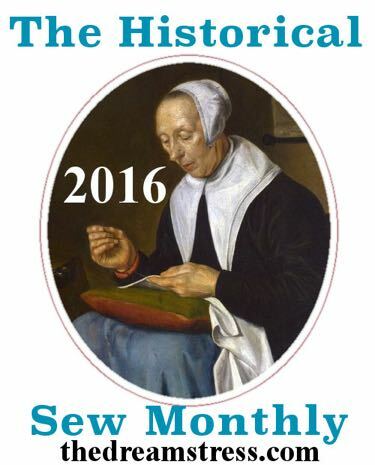 I made the bee open court robe in April, but trimmed it in June. Below the lovely red silk brocade splurge in order to make this fun outfit! The Challenge: Gender-Bender – make an item for the opposite gender, or make an item with elements inspired by the fashions of the opposite gender. Notions: Matching belt of same fabric. Bronze gold metal trim on both the open court robe and the belt. How historically accurate is it? It's patterned after the shape and seam placement of the court robes of the era as far as I can tell (I am not an expert, not having seen extant garments in person, but have looked at them online and fashion plates of the time). The trains can be very wide to very narrow, and medium to extremely long. The fabric I believe is as close to period appropriate as possible. I machine sewed the long seams and hand finished and did hand sewn trim. Hours to complete: I was about half a day in cutting it out, since I was super careful in cutting with wasting the least amount of fabric, in order to save the most possible of what was remaining. The fabric was only 30" wide, so it was quite difficult to cut out, and I had to piece on the two side train pieces. Also took a long time to sew together, sew in a lining, hem and create the belt, add the bronze gold metal trim. I lost track, but I'd say this was probably about 30 hours altogether. First worn: Worn to the Gala this year at Costume College in July 2016, with an embroidered court gown underneath! Total cost: Er, um, this fabric cost waaaaaay too much. 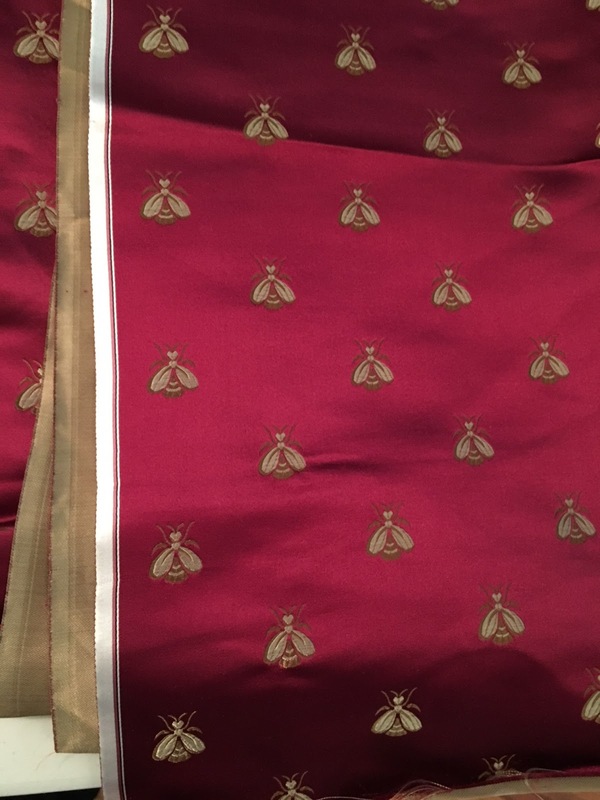 I searched for silk bee fabric for a court ensemble for years: I was looking for black with gold bees or purple or royal blue with gold bees, but burgundy with gold bees is what I could find finally, so red it was! It was $33/yard. Lining fabric was stash, and trim inexpensive. Totally worth it, I'm so happy with the finished court robe! For May's HSM Challenge, Holes, I made an Edwardian white lace Gibson Girl blouse. I'm late posting, and this was worked on in April-June. I made this to wear to a friend's summer Seaside party, but I ended up wearing a store bought Edwardian bathing suit instead (it was so much cooler in the summer heat). Here is the finished Gibson Girl blouse, with lace inserts and other holes in the garment! The Challenge: Holes – sometimes the spaces between stuff are what makes a garment special. Make a garment that is about holes, whether it is lace, slashing, eyelets, etc. How historically accurate is it? I'm not an expert in this era, but it looks period appropriate to me. It was machine sewn, which Edwardians had. I used a pattern from Folkwear for a Gibson Girl blouse that my mom had in her stash. Hours to complete: About two hours to cut out, read the pattern and prep. Probably a good 6+ hours to sew together, since I messed up a few things and picked some seams and re-did. This is the product of rushing and sewing while tired, late in the evening, lol! First worn: Not yet worn: made in May/June to wear in June, but ended up going with another outfit so will wear this in future! Total cost: The white dotted swiss cotton and lace used was from my mom's stash, so free! 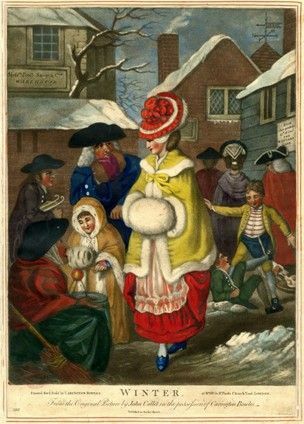 I don't know about you, but I get SO excited when I see historical fashion plates of a lovely pair of ladies in beautiful silk pelisses or hooded capes and mantles, or a Victorian woman at a skating party with a fitted mantle and matching fur-trimmed muff! I dream of warm woolen cloaks with large fur muffs and linen-lined silk fashion hooded capes trimmed in warm fluffy marabou. I'm so excited to share what I have learned about outerwear of the 18th and 19th centuries! About two weeks ago, I taught a class at Costume College in L.A. called 'Winter Wear - Hooded Cape workshop' - as you can imagine, we were making 18th (or 19th) century hooded capes! Here is the inspiration that started it all for me! I had a full limited class of 10 students, and we had 2 1/2 hours to make progress on our capes. I started the class with a short history of capes and outerwear from the mid 18th through late 19th centuries, illustrating how the shapes changed (and yet in some cases changed very little) through the years. 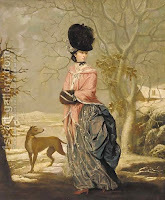 Here is a link to my Pinterest board for capes & outerwear for a more visual history of outerwear in portraits, fashion plates and extant garments. 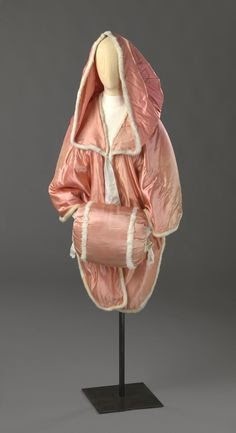 This is a subject that I'm continuing to learn about as I continue to research outerwear from the early 18th century through the turn of the century. of the extant cape & muff! After the brief cape history, everyone got their pattern kits and pattern instructions and laid out their fabric to cut out the cape and cape lining, and then the hood and hood lining. The students brought a variety of fabric, from a velvet, to a herringbone wool, to a silk satin, to taffetas, and much more: it was quite exciting to see all the options and styles that everyone chose! I helped a few students slightly modify the pattern to make one longer and one shorter, to help others with squeezing the pattern out of less fabric, how to make it reversible, whether to add additional lining for warmth or take away lining for warmer climates and more. I brought along 2 hooded cape examples, my pink silk and my blue green wool, as well as my black mourning cape, along with a rusty red hooded cape in progress, in order to show how to put the cape and hood together, how to pleat the neckline, how to pleat the hood, how to add the bias binding, and more. I'm super happy that I brought the hooded cape in progress example, as well as two slightly different hooded cape examples, as I was able to use those to illustrate how it should come together, where to lengthen/shorten, and more. Students hard at work on their hooded capes! We didn't get as far as I would have thought in 2 1/2 hours, so if I teach this again, I would make the class a little longer: overall the feedback I received from my awesome students was very positive, they said they learned a lot and enjoyed the class! If you're one of my students and you're reading this, again please reach out with any questions: you all had such pretty fabric and plans and I can't wait to see all the finished products! Two of my students finished their hooded capes already, Joy and Kailey Frye, a mother and daughter pair - Kailey is 14 (the same age as my niece, Jenny, who finished a cape as her first ever sewing project earlier this summer!). I really enjoyed teaching this limited workshop class at Costume College, and would definitely do it again! If you are interested in giving one of these hooded capes a try or missed getting into my limited class, my hooded cape pattern is now available for purchase in my etsy store, TheLadyDetalle! Use coupon code: 'COCO16PEB' to get 20% off your purchase through 9/30! And this is my next outerwear project: drape a version of an 18th century pelisse similar to this! 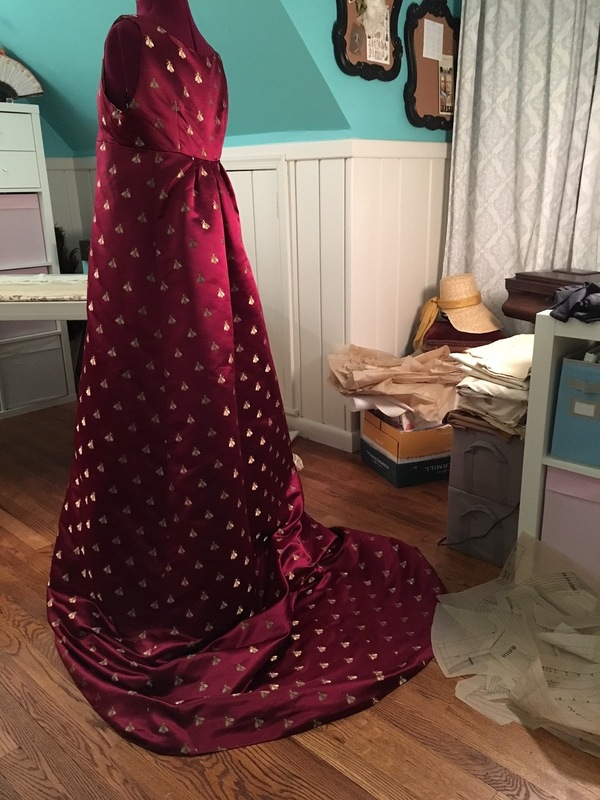 I finally started on my Regency gown made from a sari/saree today: I'm using the La Mode Bagatelle cross over dress pattern. I have everything cut out and I have the skirt mostly together: I just need to work on the bottom of the skirt, add some trim around the entire bottom. Also put the entire bodice together. 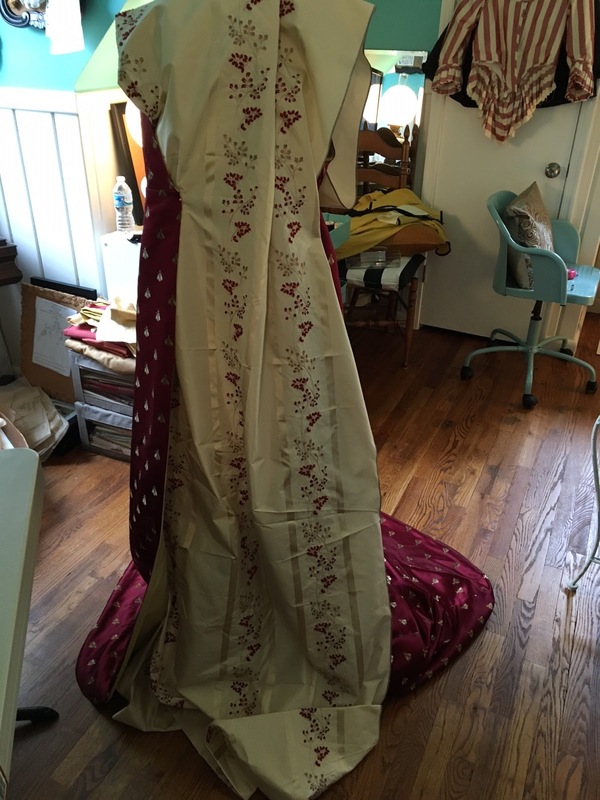 Progress on the sari Regency! The fabric is a vintage orange silk sari with heavy gold metallic thread from India, bought through an Etsy seller - totally reasonable price. I am cutting up the more ornamental part to add along the bottom the whole way around the dress (rather than just making it part of the very front of the dress). 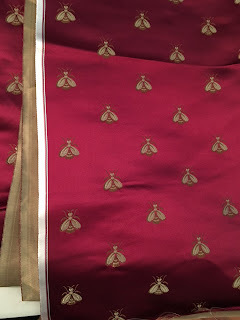 The front is strips of the gold metallic design that were all along the sari edge: I did some piecing to get enough to add the three widths to the middle front. This gown is for the candlelight dinner at my 10th Annual Pumpkin Tea at the beginning of Nov. I need to get my dress done so I can tackle Mat's Regency coat, and then I have two events in October I'm trying to make things for. 'Bees, Bees, Bees' made from red burgundy with embroidered gold Napoleonic bees silk brocade, cream silk taffeta embroidered with tiny red & cream flowers, golden bee pin on belt & gold bee hair pins (gift from my friend Angela), vintage cotton gloves, vintage fan, tiara from Ali Express (found by my friend Kat), feathers and hair by me, jewelry by Dames a la Mode, with hidden American Duchess cream 'Hartfield' Regency boots! First worn at the Saturday night Gala of Costume College 2016! This was a dream to wear, it flowed, it was fun, and it made me feel very regal and queenly! Here's a bit about the construction: I had been searching for the right Napoleonic bee fabric for an open robe for years: I was aiming for either gold with black bees, or royal blue or deep purple with gold bees, but burgundy with gold bees in a lovely luxurious silk brocade was what I could find on Ebay finally that was marginally affordable (after a few years of looking, er, but still more than I like to pay by far), so red & gold bees it was for the court robe! Once I had the bee fabric for the court robe, I went to my stash to figure out what to pair it with for the gown underneath, and came up with a 4 yard piece of embroidered silk taffeta (cream with tiny red & cream embroidered flowers in the middle photo above) I picked this fabric up in the L.A. Fashion District a few years ago, originally intended for a Regency ball gown. I loved the combination of the two fabrics, so went with it! For the Regency court open robe, I used Butterick #4890 (upon my friend Kat's advice and with inspiration from this gorgeous version she made last year!) and also a modified early Butterick/Simplicity pattern for the court gown. 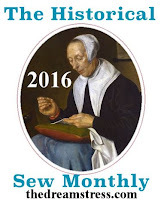 I used this extant garment and this extant garment and fashion plate for inspiration. Also here's a link to my Pinterest board for Napoleonic bees and also for court wear, where I did a lot of research on the styles of the period. Many original court trains were often longer than my train, and I just didn't want to waste my super narrow 30" width fabric on TOO long of a train, since I wanted to use less fabric and use the remaining yardage for a spencer, muff, reticule and bonnet (if I'm lucky!). So I made it the length of the pattern, which still used 9 total yards of bee fabric! sun glistens off the open robe train! from my friend Angela in my hair! The open robe court train from the back! So this court outfit had its first wearing at Costume College 2016 last Saturday: it was super fun to wear and move around in. I felt very regal with my long train, tiara and luxurious fabric. This is my first ensemble that included any silk brocade, and wow, did I love this fabric. 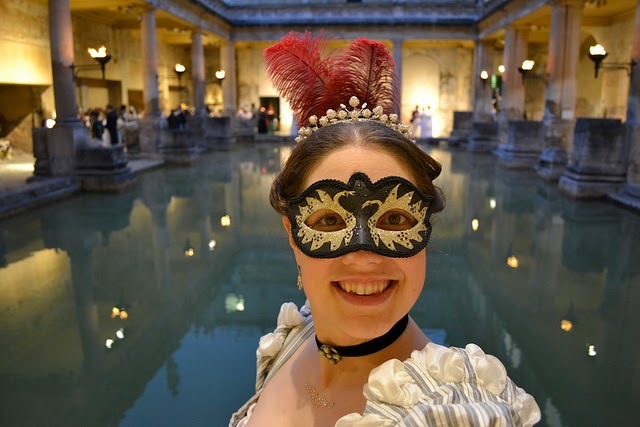 I truly felt as if I could have graced the royal courts of the day in this outfit (er, I 'felt' I could, but in reality, I'm too much of an independent modern woman to have pulled that off, LOL): I'm looking forward to wearing again sometime in future! I had a wonderful and amazing time at Costume College! The Gala was definitely an evening to remember, with so many gorgeous and amazing outfits by all the talented costumers who attended! I plan to blog about CoCo here shortly (including how my Winter Wear Hooded Cape workshop went, and post photos my outfits with construction info). I'll post more on CoCo soon! Here is a link with a few more pics on FB!